A famous Hindu temple of India. The well-known, well-visited temple is dedicated to Lord Brahma- the creator of the universe according to the Hindu mythology. The present temple dates back to 14 nth century. It is believed, Sankaracharya -the celebrated Hindu philosopher installed the idol of Lord Brahma (as ViswaKarma-the heavenly architect) in 8th century. More over, there is mention in Mahabharata- the Hindu epic about the temple which brings the antiquity to the 1st century BC. The legend says, Lord Brahma chose Pushkar for a special Yagna, which was attended by all the Gods and Goddesses. During the Yagna one petal from Lord Brahma�s lotus fell nearby. A lake was formed at that place- this is the holy Pushkar Lake. As the Yagna progressed, the priest asked Lord Brahma to be present with his wife Goddess Saraswati. Somehow, the Goddess was found missing. As there is no time to wait, the Lord asked Indra to find a suitable girl to officiate as Lord Brahma�s wife so that rituals can be completed within the stipulated auspicious time. With the permission from other Gods, Indra managed to get a local girl called Gayatri. Lord Brahma accepted her as his second wife and the rituals were completed in time. In the sanctum sanctorum both Gayatri is also worshipped along with Lord Brahama. Mean while, Goddess Saraswati returned to the Yagna sala. She became angry when she learned the Yagna was completed without her presence and that too with another women officiating as Lord Brahma�s wife. She left the place; went to a nearby hill known as Ratnagiri hill. There is a separate temple for Goddess Savitri there. One need to climb few steps to reach the temple, but the effort is rewarding as it gives a breathtaking view of the Pushkar town. The Pushkar Camel fair, held in November, is famous internationally. Actually this is part of the Brahma temple festival in which many takes a holy dip in Pushkar Lake and worship Lord Brhama. Pushkar has many orther temples too. Goddess Gayatri, the second wife of Lord Brahma has a separate temple nearby. Beisdes, there is Waraha temple dedicated to the fifth incarnation of Lord Vishnu revered with equal respect as to the Brahma temple. Rangji temple, dedicated to Lord Vishnu, is particularly note worthy for its South Indian style architecture with Gopura in Tamil style. 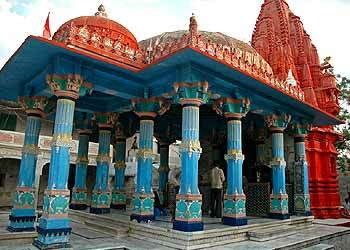 Apteshwar temple dedicated to Lord Shiva is the other notable temple in the area. The claim that this is the only temple for Lord Brahma seems incorrect. There are at least two temples in the country where worship of Lord Brahma is going on. Dudhai in the state of Madhya Pradesh and Brahma temple at Thirunavaya near Tirur in Kerala are examples. Pushkar is eleven kilometers from Ajmer- a major city of Rajasthan and a Muslim pilgrimage centre. Ajmer is an important railway station. Ajmer is about 135 kilometers from Jaipur- the state capital.